The R35 Nissan GT-R is a very capable car, stock. From 2009-2011 magazines and owners have found: 11 second quarter mile times, 0-60 in 3.5 seconds(or under). 193 mph top speeds. 7:26:7 at Nurburgring. 1:56.9 at Buttonwillow. 1:19.7 on the Top Gear test track. No matter what you drive, those times are quick. Quick, but we can do better. STILLEN Stage 1 Package takes your standard Nissan GT-R VR38DETT and increases horsepower and torque over 100 whp, and 130 ft-lbs. Not only do you have impressive horsepower gains, the parts weigh 25 lbs less than stock parts. The engine performance is often the first, and easiest thing for owners to upgrade, but there are other areas of the car that can be improved upon. 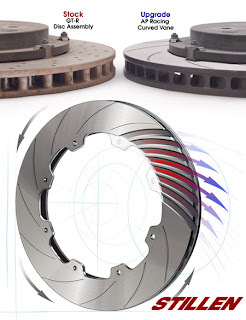 The factory Brembo brakes are adequate for a street car, but crack around the cross drilled holes. A very popular upgrade is the AP Racing J-hooks, or Slotted rotors. They are less expensive than the factory rotors, and owners report them lasting three times as long as the Brembo rotors. With the engine, brake, and suspension addressed, go out and improve on those 0-60, 1/4 mile, and track times. When you are ready for more, there is much more available from Penske 2 way adjustable coil overs, to Carbon Ceramic Brake upgrades, to turbo, and engine upgrades. 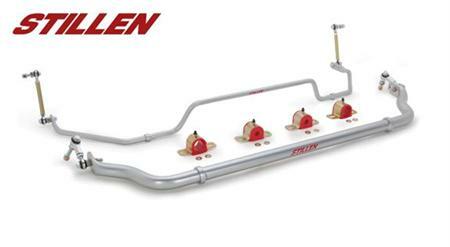 Check the STILLEN catalog for a few of the performance parts available for the Nissan GTR. Who's 21st Birthday is Today?